We have calculated the electronic density of states (DOS) and dielectric function for the ThX (X = P, As and Sb) using the linear muffin tin orbital method within atomic sphere approximation (LMTO–ASA) including the combined correction terms. The calculated electronic DOS of ThSb has been compared with the available experimental data and we find a good agreement. The calculated optical conductivity for ThP and ThAs is increasing monotonically, while for ThSb a sharp peak has been found at 6.5 eV. Unfortunately there are no experimental data to compare with calculated optical properties, we hope our calculations will motivate some experimentalists. Temperature dependence of d.c. conductivity is studied in 𝑎-Se75In25–𝑥Pb𝑥 thin films where 𝑥 is varied from 0–10. From these measurements, the values of the pre-exponential factor (𝜎0) and activation energy (𝛥𝐸) are calculated for each glassy alloy. An approximate linear dependence of ln 𝜎0 on 𝛥𝐸 is observed in this glassy system with good agreement between the expected and calculated 𝜎0 values using Meyer–Neldel rule. Linear dependence of ln𝜎0 on 𝛥𝐸 in case of amorphous materials indicates that the conduction band tails a finite energy distance towards the valence band and Fermi level is controlled by fixed dominant hole levels deeper in the gap. Temperature and frequency dependence of a.c. conductivity have been studied in glassy Se100–𝑥Te𝑥 (𝑥 = 10, 20 and 30) over different range of temperatures and frequencies. An agreement between experimental and theoretical results suggests that the a.c. conductivity behaviour of selenium–tellurium system (Se100–𝑥Te𝑥) can be successfully explained by correlated barrier hopping (CBH) model. The density of defect states has been determined using this model for all the glassy alloys. The results show that bipolaron hopping dominates over single-polaron hopping in this glassy system. This is explained in terms of lower values of the maximum barrier height for single-polaron hopping. The values of density of charged defect states increase with increase in Te concentration. This is in agreement with our previous results obtained from SCLC measurements. 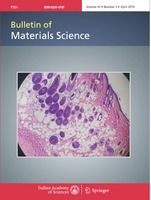 For tissue engineering purpose two gelatin based polyester urethane scaffolds of different compositions were prepared from lactic acid, polyethylene glycol 400 (PEG 400) and characterized by FTIR, XRD for their mechanical and morphological properties using SEM and optical microscopic analyses. Degradation and swelling studies of gelatin based polyester urethane scaffolds in phosphate buffer saline (PBS) were performed. Human keratinocyte cells were cultured within these scaffolds, which showed good cell adherence and proliferation. Nanostructured thin films of tantalum and titanium were deposited on glass substrate using d.c. magnetron sputtering technique under the argon gas environment at a pressure of 0.1 mbar. Optical transmission and absorption studies were carried out for these samples with pressure of hydrogen. Large changes in both transmission and absorption on loading these films with hydrogen are accompanied by significant phase changes and electronic transformation. Optical photograph shows the colour variation after hydrogenation in case of tantalum film which may be used as decorative mirrors and hydrogen sensors. The hydrogen storage capability of thin films was confirmed by variation in optical properties. Nanocomposites of mixed oxides of iron and neodymium in polymer matrix of anilineformaldehyde are reported. The composites have been obtained by treating the aqueous solution of aniline, hydrochloric acid and formaldehyde with halide of iron and neodymium oxide. The infra-red spectra show broad peaks at ∼ 590 cm-1 and at ∼ 610 cm-1 due to the presence of oxides of both iron and neodymium. In heated samples, the absorption peaks due to metal oxides are better resolved. A broad and strong peak in XRD spectra at 2𝜃 value of 35.69920 corresponds to spinel 𝛾-Fe2O3. 57Fe Mössbauer spectrum for unheated sample gives Mössbauer parameters, i.e. isomer shift (𝛿), quadrupole splitting (𝛥 𝐸) and effective magnetic field (Heff). Transmission electron microscopy (TEM) micrographs reveal well dispersed particles at different magnifications. Vibrating sample magnetometry (VSM) studies indicate that the ferrite nanoparticles exhibit characteristics of ferromagnetism. The glassy alloy of Se83Te15Zn2 has been prepared by conventional rapid melt-quenching technique. The glassy nature of the prepared alloy is confirmed through X-ray diffraction (XRD) technique. A thin film of the aforesaid material was prepared by thermal evaporation technique. Coplanar indium electrode was used. Current–voltage (𝐼–𝑉) characteristics and photoconductivity measurements were obtained. At low electric field, ohmic, and at high electric fields (𝐸 ∼ 104 V/cm), non-ohmic behaviour was observed. An analysis of the experimental data confirms the presence of space charge limited conduction (SCLC) in the glassy material studied in the present case. From the fitting of the data to the theory of SCLC, the density of defect states (DOS) near the Fermi level was calculated. Temperature dependence of conductivity in dark as well as in the presence of light shows that conduction is through a thermally activated process in both the cases. The activation energy is found to decrease with the increase in light intensity. This indicates the shift of the Fermi level with intensity. Transient photoconductivity measurements at different temperatures indicate that the decay of photoconductivity is quite slow, which is found to be non-exponential in the present case, indicating the presence of a continuous distribution of defect states in the aforesaid glassy alloy.